Today everything revolves around social networks like Facebook, Twitter, Pinterest and 9gag. When someone sees something special, funny or weird in any way, they will photograph it and publish on some social network. The connection between digital camera and internet, especially social network is more important than ever. People from Fujifilm decided to use this connection and make a digital camera that can in an easy and fast way share photos between smart phone and digital camera. The Fuji FinePix F800 is a digital camera from Fujifilm that has one application for easier and better sharing photos between digital camera and your smart phone or tablet. The whole camera is very simple and elegant, it has elegant curves and it is available in three colors; red, blue and black. They made it with rubber edges to prevent it from slipping, which is great move. This camera has a manual pop up flash, which you can open with one button and you can close it just by putting it back in the camera. It is very easy to handle with simple commands. On the top of the camera there are few buttons, like the power button and function button. The great thing about this camera is that is has separate button for video control so you can start recording no matter what you are doing at the moment. 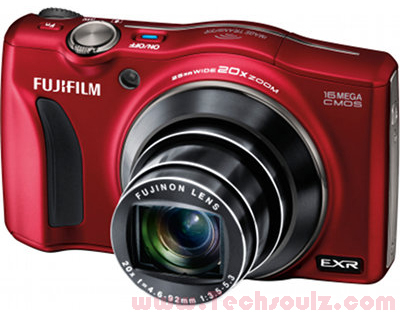 This Fuji FinePix has 16.6 megapixels EXR CMOS sensor for high quality photographs. Photos taken with this digital camera are great, sharp and clear with great colors, even in low lights. This camera has great wide-angle which is perfect for landscapes or group photos. The video recorded with this digital camera is HQ with excellent stereo sound. This camera is different from other cameras because with it you can share your photos on the digital camera with you tablet. This is named Wireless Image Transfer. You can just turn it on and expect from it to work, you'll have to download an application to your smart phone or tablet named Fujifilm Photo Reciever. A Fujifilm Photo Reciever is an application made by Fujifilm for you to synchronize your Fuji digital camera with Wireless Image Transfer and your smart phone and tablet. It is compatible with both iPhones and Android smart phones and iPad and Android tablets, so you can download it for both brands on the internet. When you open the application, it shows you the list of the cameras with what you can use it. The application is free and compatible to almost every brand of tablet and smart phones on the market. When you start this application, you can upload photos directly from your digital camera without any passwords or any kind of identification. You don't have to upload every picture separately; you can do it in about 30 pictures at a time, no more than 2 GB in size, which is a great thing. Before choosing which one you will download you can browse on you tablet and see which pictures you have and then choose only few you like. AUTHOR BIO: Edo is a student in Polytechnicum Zagrabiense in Zagreb and he is a big technology fan. He researches devices and then he makes a website about that device with advises and reviews to help others. His last page is The best digital camera.